La Tortuga I, Los Lances beach, Tarifa. 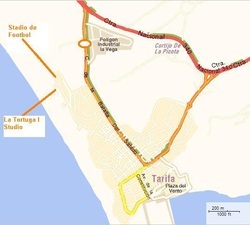 La Tortuga I is in front of Calle de Nebrija, on the beach with nearby shops, supermarkets, bars / restaurants. You can walk into the old town and port via the main street (Batalla del Salado) or beside the beach on the well lit paved promenade (Passeo Maritimo). La Tortuga I is a spacious, one room studio with a tiled bathroom, a modern kitchen area, a large private terrace and sea views right down to Las Dunas. Ideal for two people, it can sleep up to four - as it has a comfortable double bed plus a double pull-out sofa bed. >> Rental Information - studio facilities, rates and seasons. Looking for somewhere great ﻿﻿to stay in Tarifa? Click below to see live feeds (free SpotFav login required) or try our Weather and Surfing page for more info. Tarifa, Los Lances, Cadiz Province, Andalucía Region, Southern Spain. Click here for details of our Piaggio Ape Calessino tuk tuk websites.